HF: Three buildings have been restored at the mining village close to Ma On Shan Iron Mine where miners and their families lived during the mine’s active life from 1906 to 1976 and especially during the 1950s. The Sunday Morning Post of 18th January 2015 contains an article, Ex-residents return to see village come back to life. 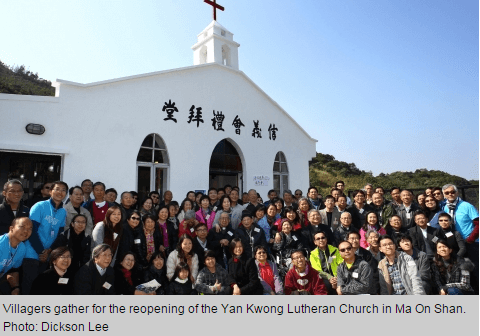 The article says that the Yan Kwong Lutheran Church, built in 1952, the primary school, built in 1961, and the former teachers’ quarters have been reopened after a refurbishment programme. On the day before the article dozens of people who used to live in the village, which now has only 80 families, returned to take part in the re-opening celebration. A second stage of the project will see an old kindergarten and shed turned into a museum and activity room documenting the village’s mining past.